DKS Ltd. has many years of experience with the environment, production, and quality. Our awareness of the fact that all soaps and detergents end up in the nature results in, that the components and ingredients we use must be 100% biodegradable in the nature. 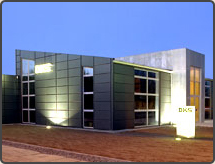 Today DKS has a modern production facility that ensures a uniform production through advanced computer technology. The raw materials are controlled by our suppliers, who also guarantee that the products are not tested on animals. DKS Hair- & Bodycare products are specially formulated and added with caring ingredients, which in an appropriate measure gives optimal effect to hair and skin.